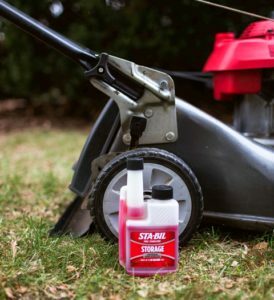 For all 2 and 4 cycle engines add a fuel stabilizer to your gas can every time you fill up so the fuel in the gas can and your equipment is ready for the off-season. Adding a fuel stabilizer will help prevent the fuel from breaking down during the off-season along with the buildup of gum, varnish and corrosion. A fuel stabilizer like STA-BIL will protect your equipment for up to 24 months. Many engine manufacturers are recommending filling the gas tank 95 percent full of fuel treated with a fuel stabilizer before storage to help prevent rust on the metal parts and protect seals and gaskets. Use a fogging oil to prevent corrosion and keep the cylinder lubricated to protect the engine from damage when you start it up at the beginning of the next season. Replace your spark plug for easy startup next year. You can add an anti-seize lubricant to the spark plug threads for easy removal each season. Replace your oil if you have a 4 cycle engine. You don’t want contaminants and deposits settling in your small engine equipment during the off-season. New oil will coat the engine with rust inhibitors and lubricate the parts to prevent damage and make it easier to start. Clean your small engine equipment and dry well before storing to help prevent corrosion. Keep the fuel cap area clean to prevent debris from getting into your gas tank. Check the nuts, bolts, belts and tires. If you have small engine equipment with a battery to start the engine, remove the battery, clean the terminals and store it in an area that stays above freezing. 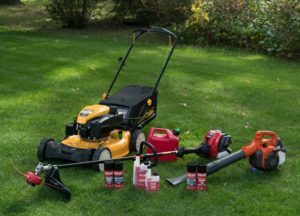 Taking these steps before storing your power or small engine equipment will ensure that it is in the best possible condition come springtime. This was written by Fix It Home Improvement. My question is related to the winter storage of 2 & 4 cycle engines, is one procedure better than the other? One person says to top off the fuel tank, along with the obvious other details of adding a fuel stabilizer, fogging, change out the spark plug, oil, air filter, and do the basic preventative maintenance all around. The next person will tell you to run engine tank completely out of fuel after adding a mixture of fuel stabilizer and some type of lubricating oil, then change the oil, spark plug, oil, and air filter, and do the basic preventative maintenance. Hello, we recommend keeping your fuel tank full and topping off with fuel stabilizer. Please email us at marketing@goldeagle.com if you have any questions about this. Thank you.